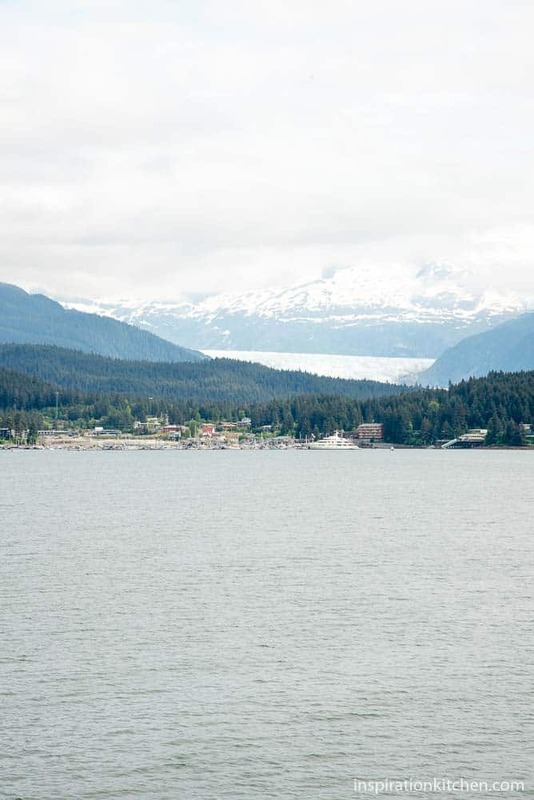 For Craft Beer and Home Brew lovers, head to small town Haines, Alaska. 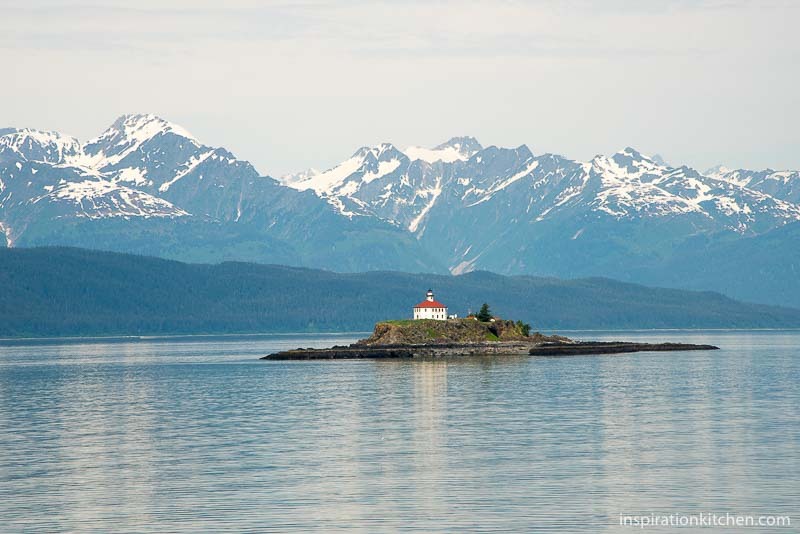 A beautiful, quaint and personable town, it’s home to the Annual Great Alaska Craft Beer and Home Brew Festival. 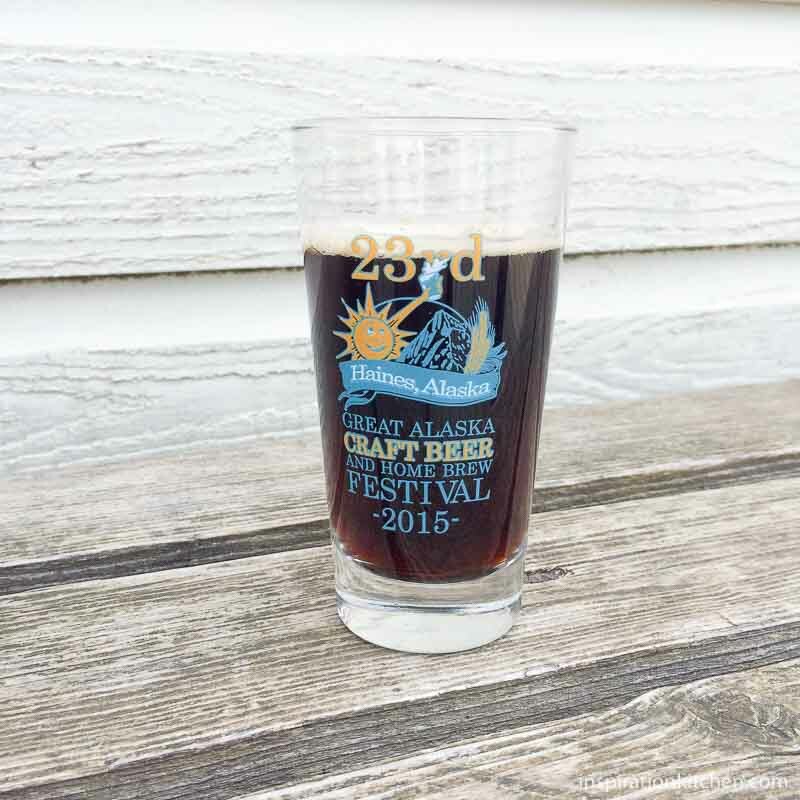 Day 3 of the Press Trip led us to travel by ferry to Haines, Alaska to enjoy the 23rd Annual Great Alaska Craft Beer and Home Brew Festival. This all-day festival brings 1,500+ craft brew lovers flocking to enjoy a myriad of craft and home brews. What I found so amazing, was seeing the vast number of people walking or biking for miles, along the highway, in order to attend. With their backpacks and camping gear strapped to their backs, clearly these were some serious craft brew lovers. 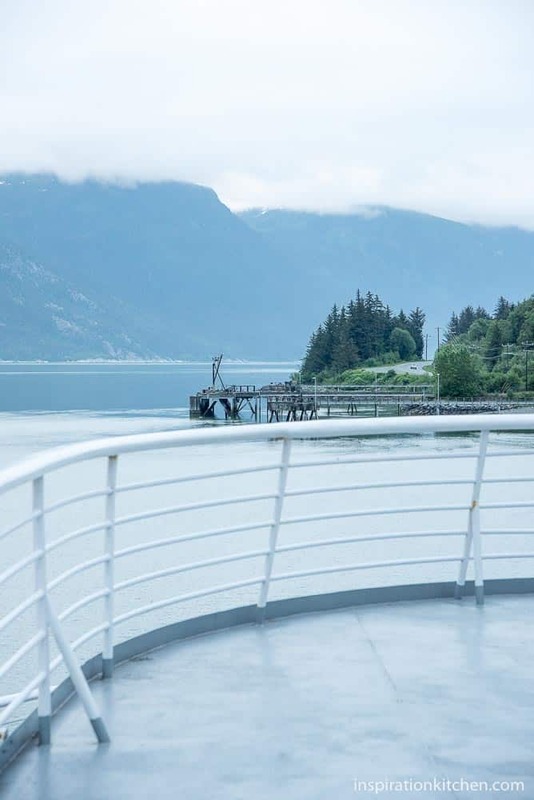 Our trip to Haines began with a very early start, leaving the shores of Juneau on the Alaska Marine Highway System, where we boarded the ferry, to embark on our 4 1/2 hour trip. Even at the early pre-6 a.m. hour, the sun welcomed us with it’s brilliant glow. I wanted to share a photo of my traveling partners, simply incredible women, that I had the extreme privilege to travel with. From left to right: Bri and Megan from Thompson PR, Vanessa and Maureen. 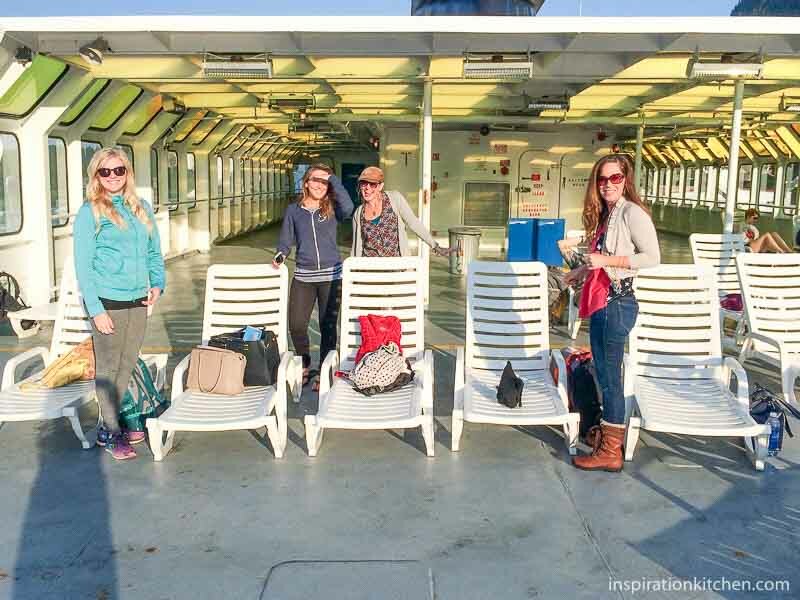 The five of us quickly became the closest of friends, and I can’t imagine having traveled with more beautiful, incredible, powerful and inspiring women. To this day, we remain in touch as great friends. 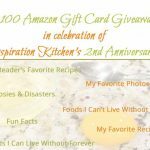 Vanessa is an accomplished Food Stylist, Culinary Producer and Recipe Developer, while Maureen is a Lifestyle Expert, journalist and author and can be seen on The Today Show. You owe it to yourself to meet these powerhouses – so be sure to visit their sites and give them some love! Of course, as the early birds, we had our choice of prime seating on the deck. If you get the opportunity to travel this way, it’s worth the early rise to score these premium seats, where you get to experience the most incredible views! 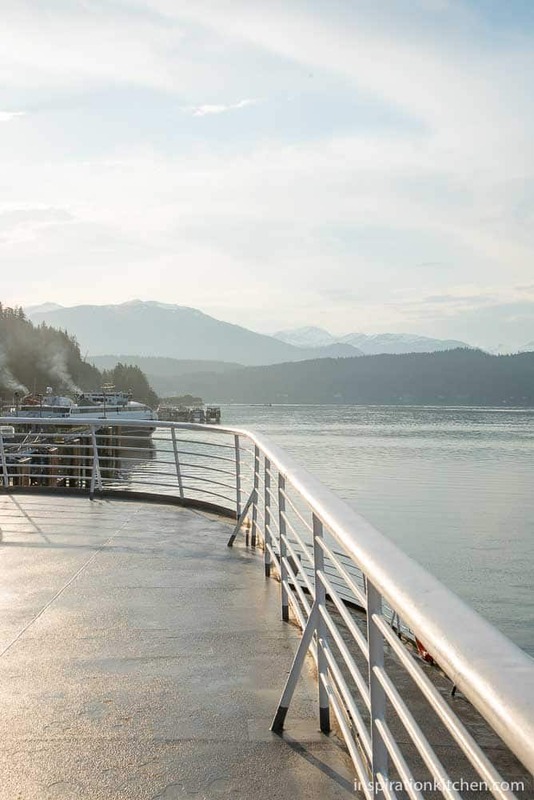 Tell me…have you ever ridden a ferry? If not, you must! 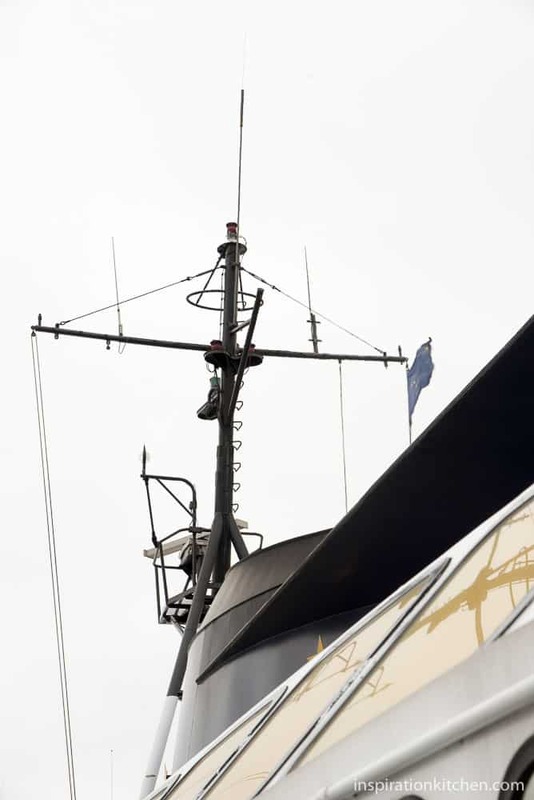 It is one of the smoothest, most soothing ways to travel and you get the pleasure of enjoying views at a leisurely pace. I fell in love with the view directly in front of where we sat. 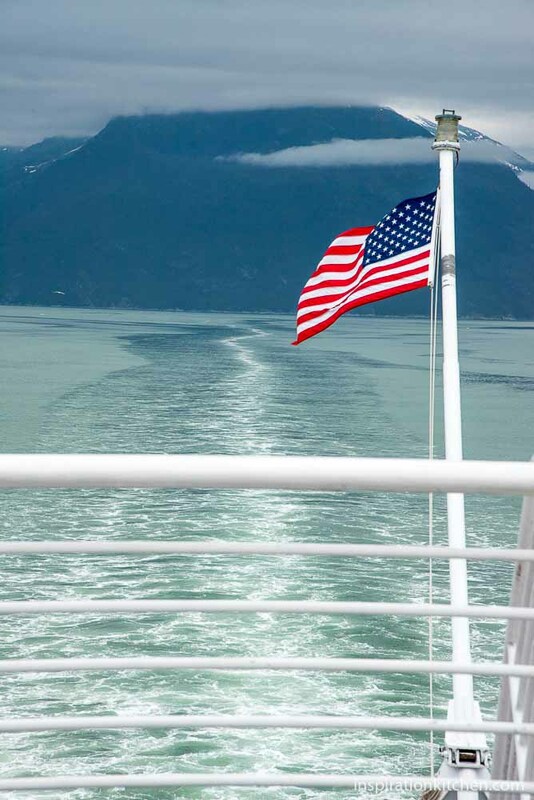 The American flag proudly flickered and danced as we waved and said our goodbye to Juneau. The thump of the ferry’s engine is ssssoooo soothing as the ferry fluently glides across the water, leaving a large wake in it’s shadow. 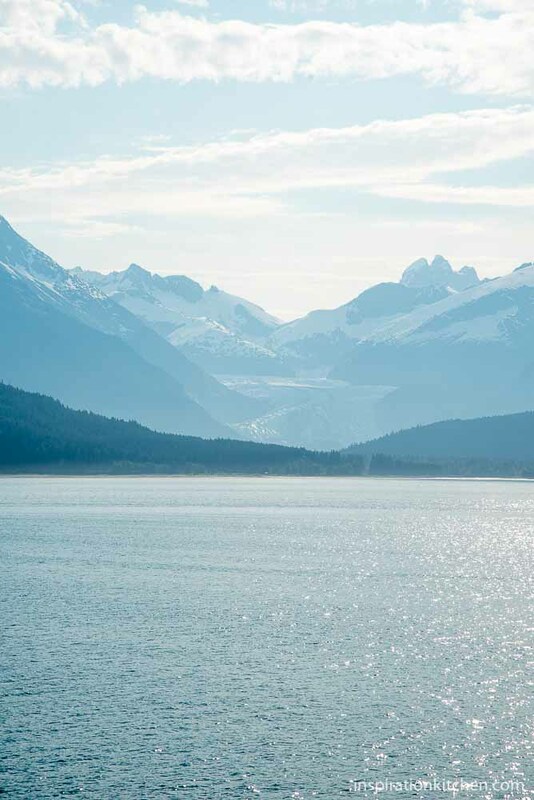 With Alaska’s air so fresh, clean and crisp, you can hear the mysterious call of the mountains. 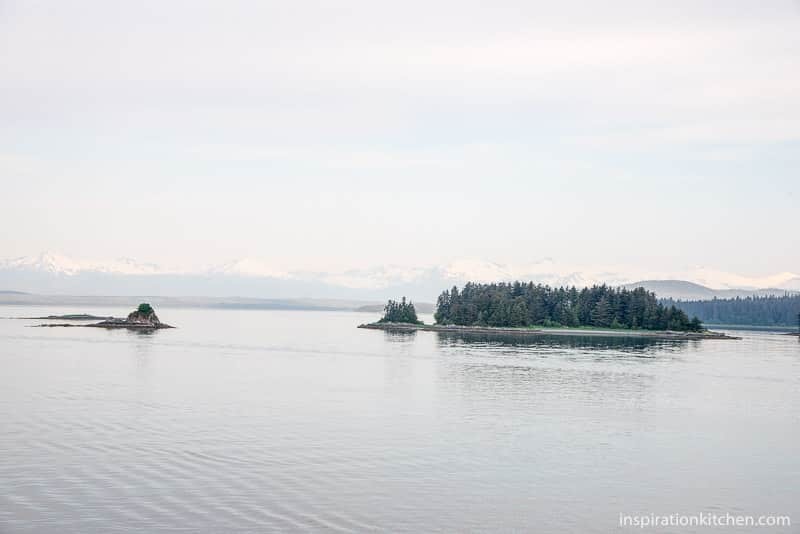 It was here, on this ferry ride, that I could feel Alaska speaking to me. Has something ever moved you so profoundly that you know it’s speaking to you? That is how you cannot help but fall utterly and completely in love with Alaska. 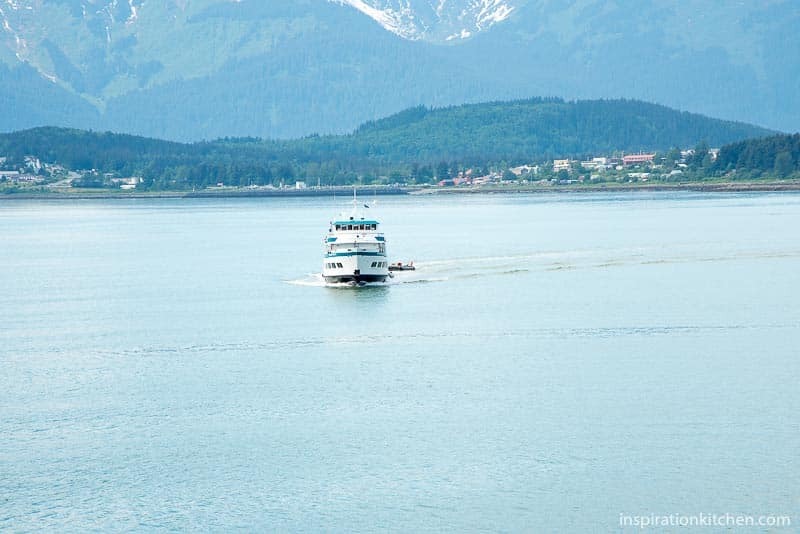 I mentioned in my Travel Juneau Alaska post that many people that live in Alaska are not natives, but are transplants. I know why – it’s the call of those mountains, because I felt it myself. It’s the quiet lap, crest and fall of the water, the ethereal, mysterious, winding curves of the mountains, and the silent whisper of the earth’s sky. 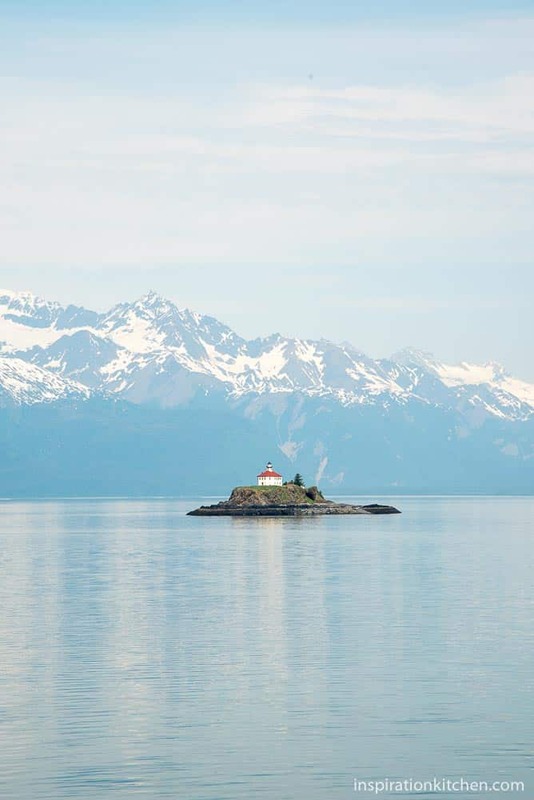 It’s so still, quiet and peaceful, that at least once, you’ll be drawn to Alaska too. 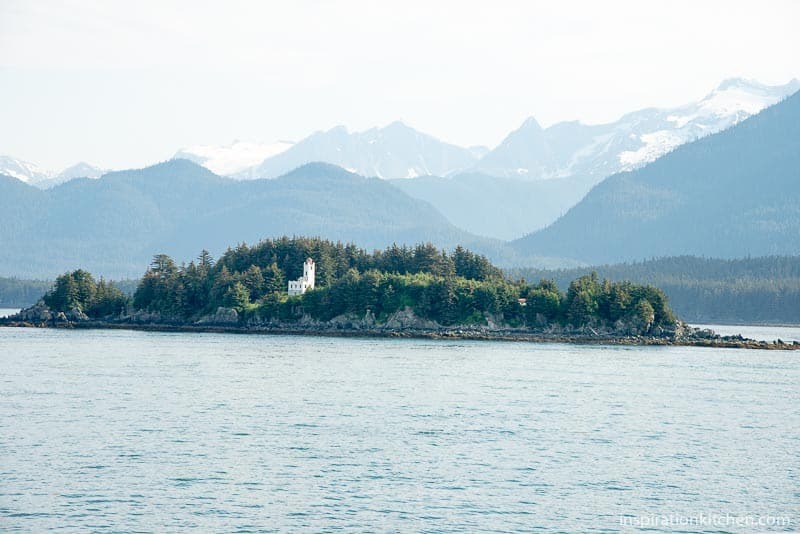 Along the way, as your continue your journey, you’ll enjoy views of the Lighthouses between Juneau and Haines. I fell in love with the setting of Eldred Rock, which stood like a fortress on a small island with the massive mountains looming in the background. This setting was so spectacular with the morning sun reflecting and shimmering off the water. Here, you’ll also see Sentinel Island Lighthouse with its white concrete walls and red lantern. Amidst the water and the mountains, there’s something soothing about having them there. 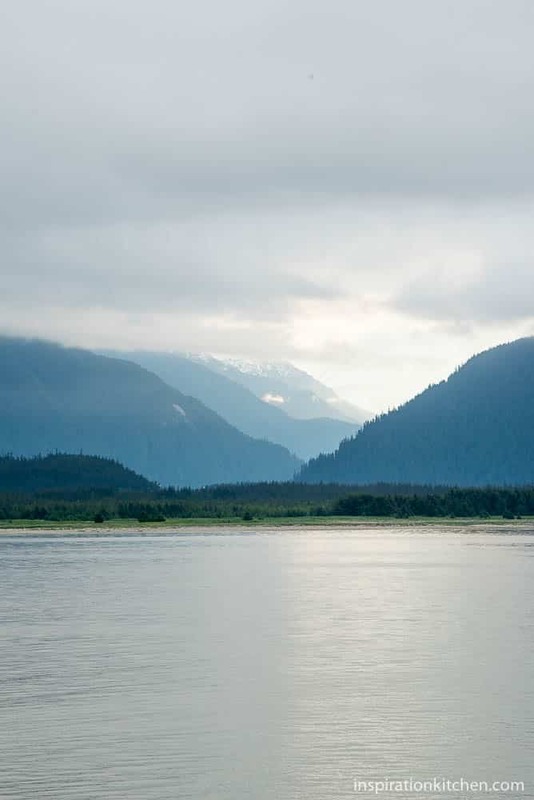 As we neared the banks of Haines, the water was so serene, calm and glistened with the morning sun. 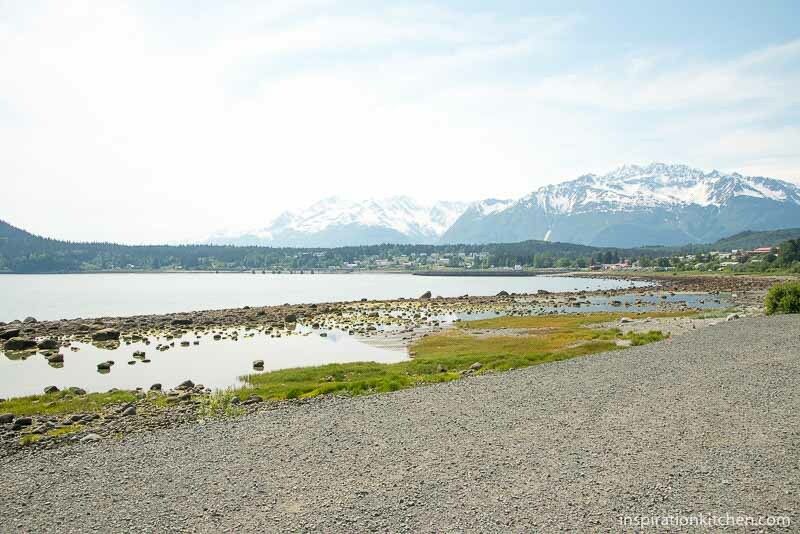 We welcomed the shores of Haines, after our long ferry ride, and eagerly anticipated our tour of the quaint town of Haines, before embarking on the Brewfest. 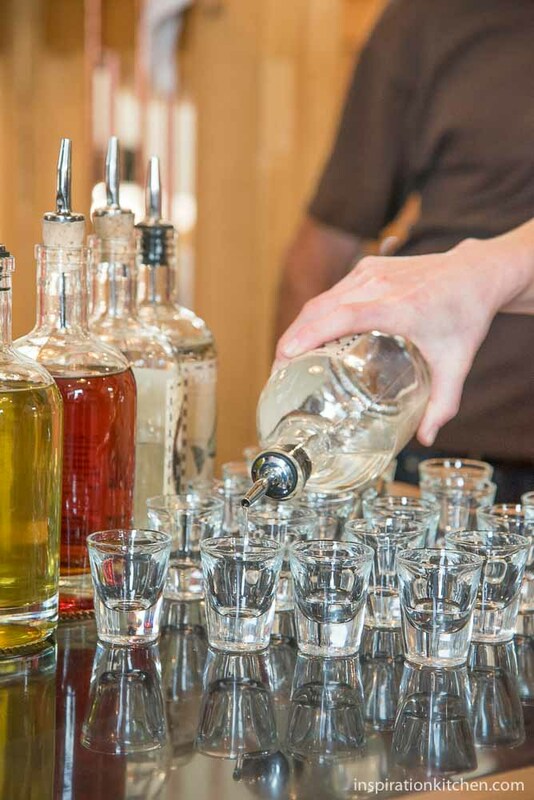 Following the brewfest, we visited Port Chilkoot Distillery to taste-test some of the finest spirits in Southeast Alaska. There, we met Heather Shade, Head Distiller, and her partner, Sean Copeland, an incredible craftsman who built a beautiful Tasting Room in their distillery, on the hill overlooking Haines. 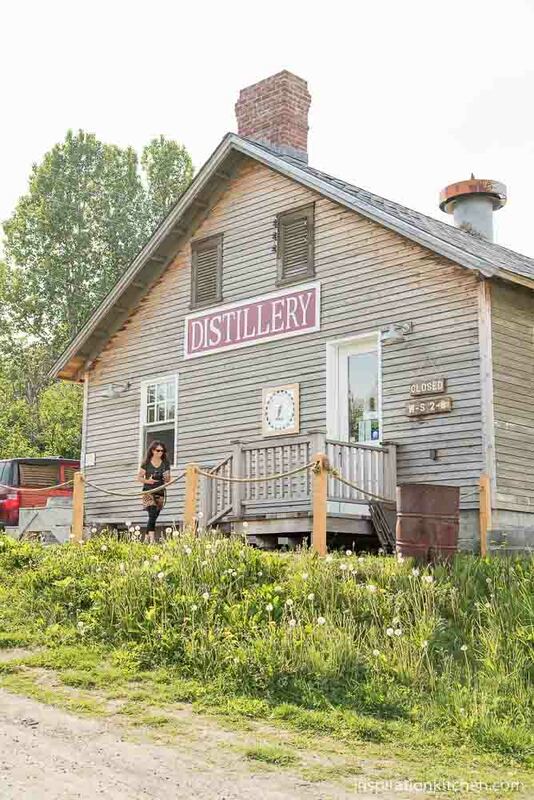 If you ever get a chance to visit Haines, don’t miss this incredible distillery. 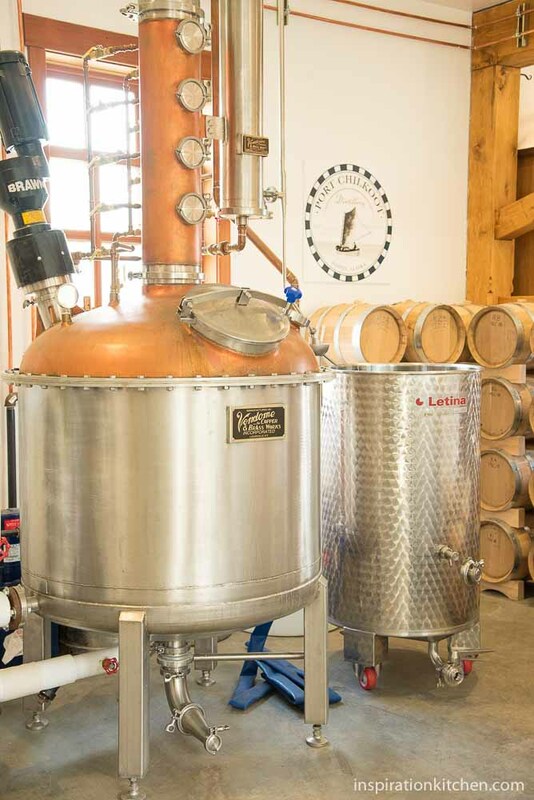 Not only is Heather and Sean some of the nicest people you will ever meet, they are passionate about distilling a high quality product that shines when you taste their spirits. 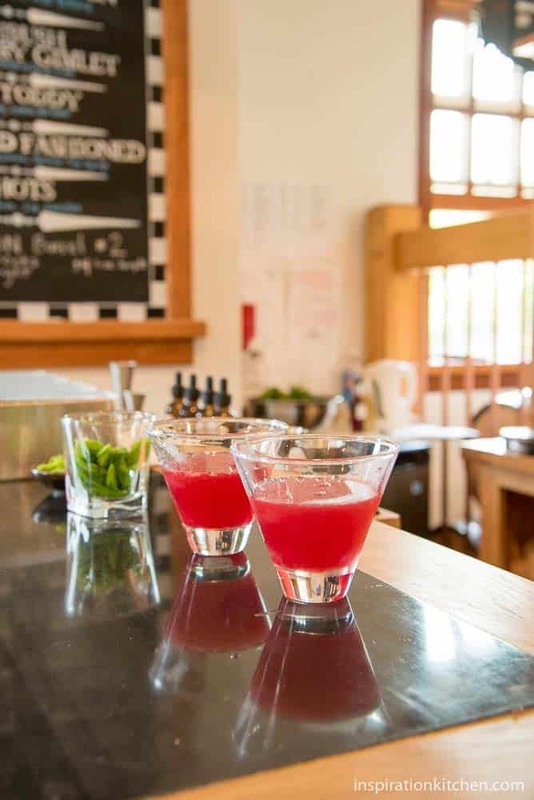 Their Tasting Room offers a selection of mixed spirits, as well as any custom blend. 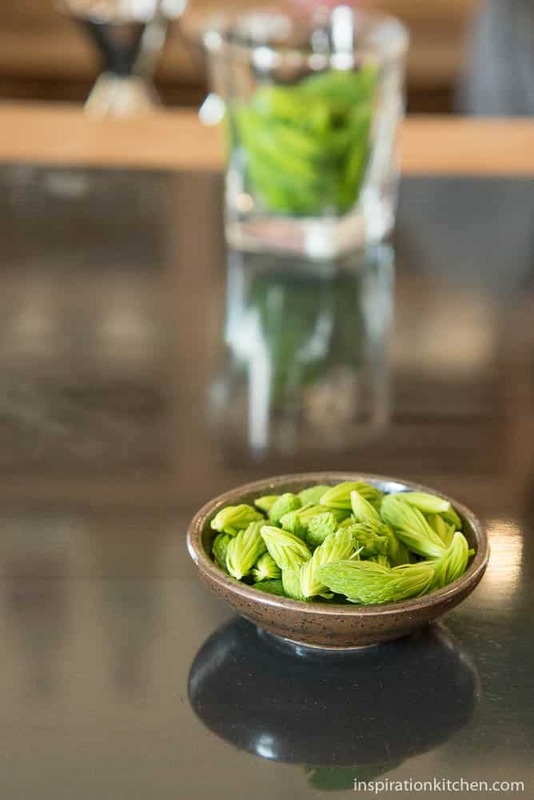 Throughout our travels, spruce tips seemed to be the hot new ingredient in distilleries and breweries. Because we kept hearing about spruce tips over and over as we traveled, I couldn’t help but take a photo of these treasured little gems. In fact, we all took photos of the spruce tips! 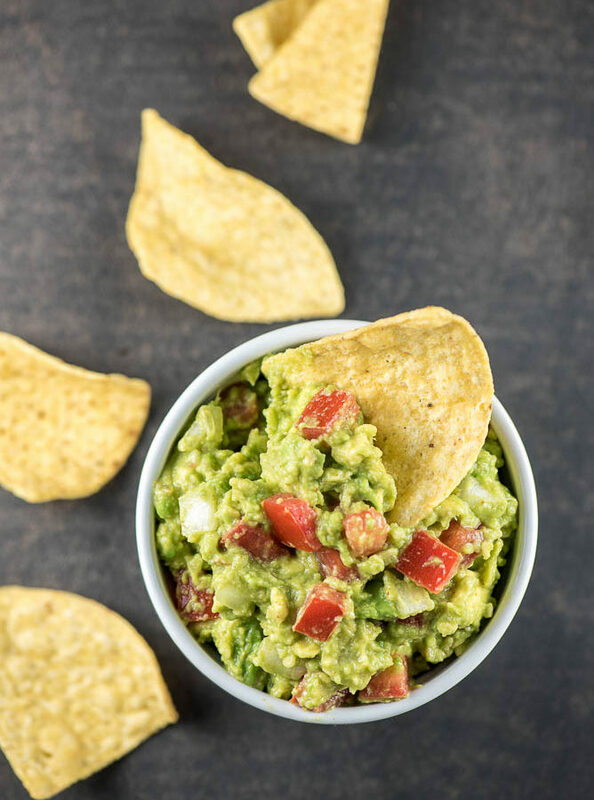 You have to admit…, they are a gorgeous green color – just ripe for the picking. 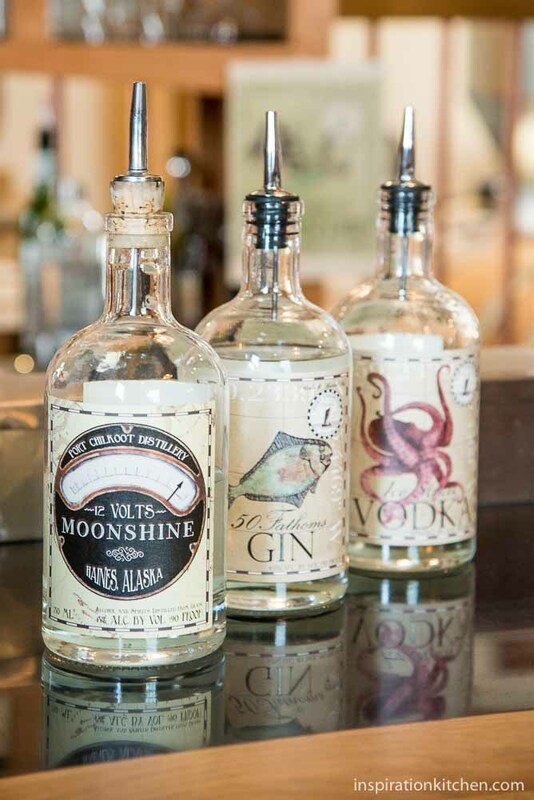 Here are their three flagship spirits: Gin, Vodka and my personal favorite, Moonshine. 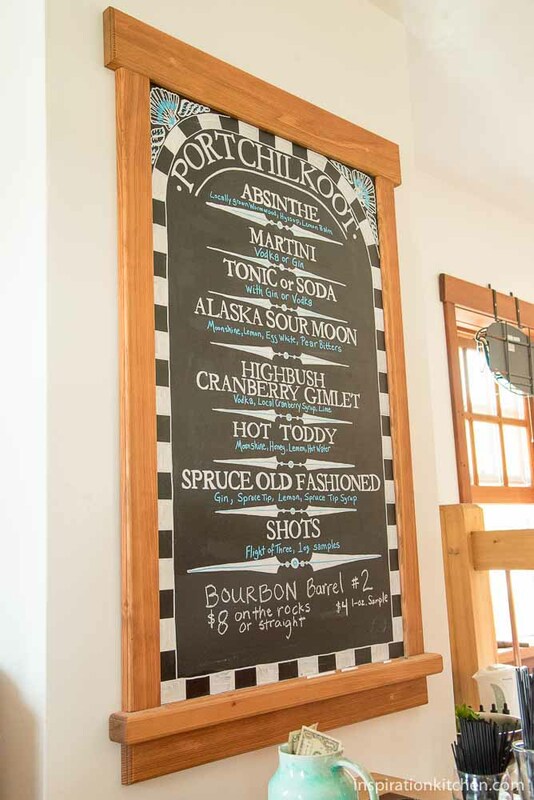 Prior to visiting the Port Chilkoot Distillery, I’d never tasted Moonshine. I had, however, watched my share of Moonshiner episodes, so you can imagine how excited I was to get my first sip of Moonshine. Can I just tell you… it was fabulous. Crisp, clear and most importantly, super smooth. When you’re on a food and drink press trip, as a food lover, professional and journalist, it’s your responsibility and job to taste, test and try samples at every establishment you visit. It’s not necessary or required, however, to like, buy or write about your experience. Seriously. I would’ve thrown out the all-weather boots I’d packed in my suitcase to make room for that bottle of Moonshine! Seriously good stuff. So light, smooth and drinkable, the Port Chilkoot Moonshine is served best straight up. And if you have any spirit lovers in your life, it would make an incredible gift. After a full-day at the Brewfest, and a tour of the Port Chilkoot Distillery, it was time to enjoy some of Haines finest food. 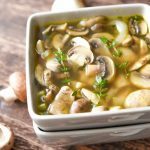 You can find it at the Commander’s Room Restaurant at Hotel Halsingland. 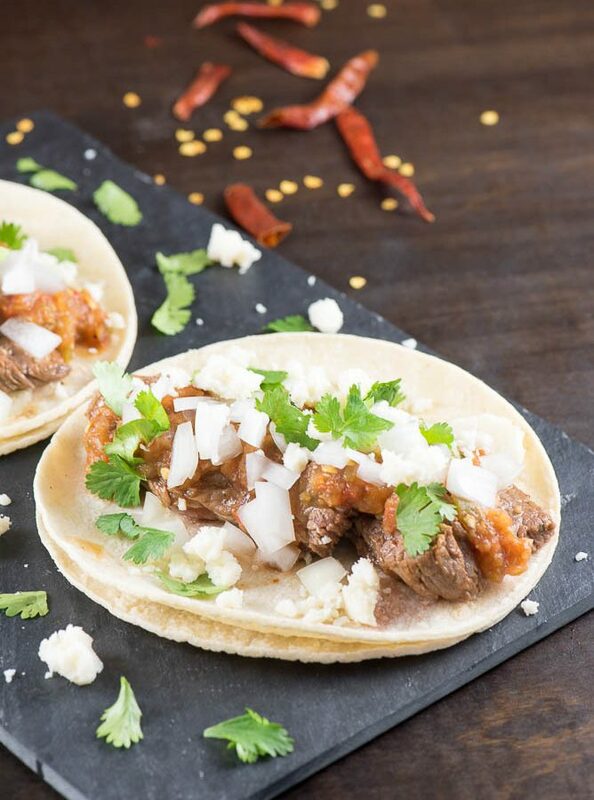 This charming restaurant has a comfortable atmosphere, great service, and incredible food. 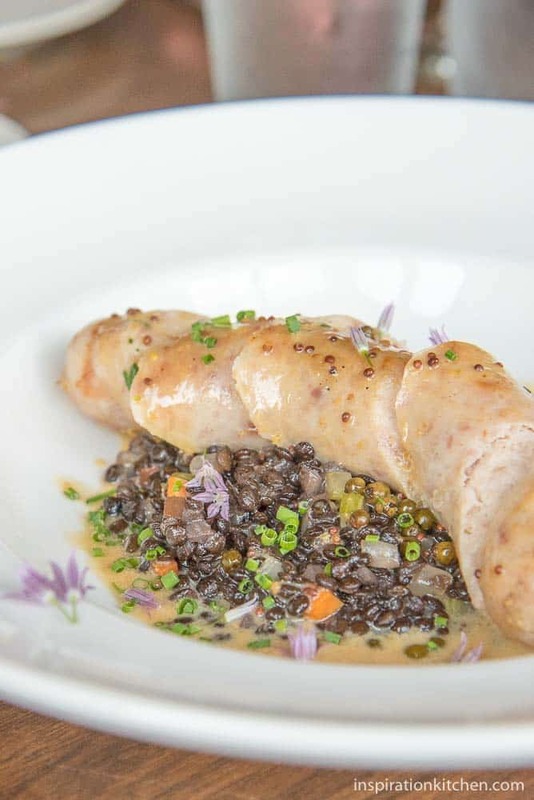 Here is a home-made delicate rabbit sausage, served with black beluga lentils cooked with red wine, surrounded by a green peppercorn brandy and mustard sauce and artfully decorated with purple chive flowers straight from their garden. My dish was a grilled halibut filet with Alaska spot prawns. 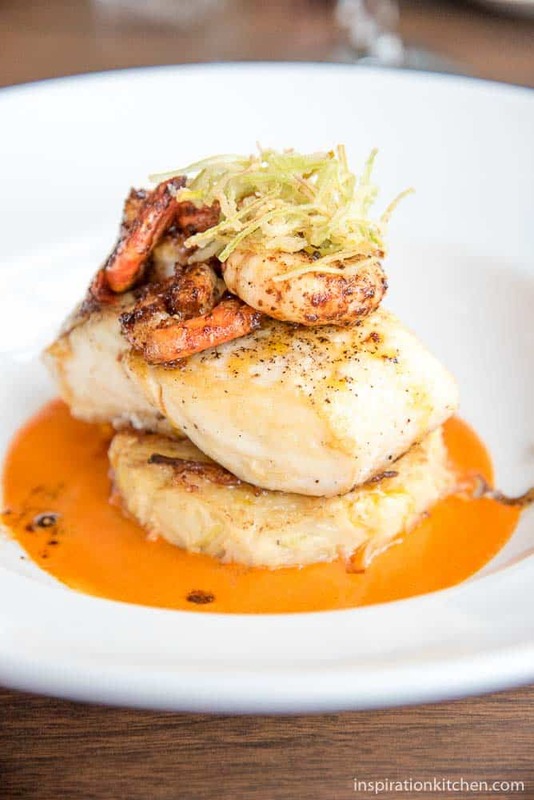 A phenomenal layered dish that starts with a perfectly grilled halibut filet that sits atop a parmesan, leek, rice noodle flan, then is topped with local Alaska spot prawns tossed in a spicy, smoky seasoning and garnished frizzled leeks with an orange sauce piquillo peppered coulis. Absolutely elegant looking and even better tasting, you won’t want to miss trying it. 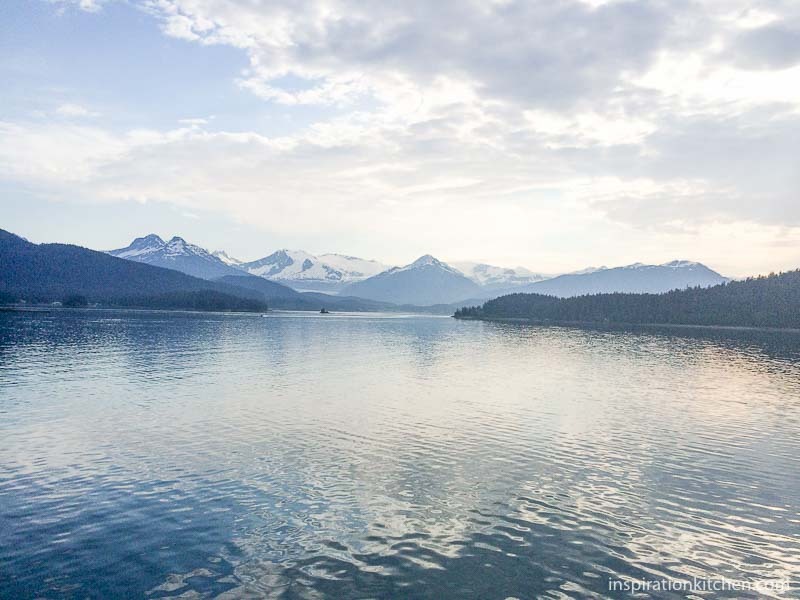 The next morning, on our trip back to Juneau, we again reveled in Alaska’s glorious landscape. Here we make our final return to the shores of Juneau, snuggled in the mountains. For the first time on this blog, I wanted to share a panoramic video I took of the scenery. The Mountains of Haines Alaska from Kristi Kaiser on Vimeo. I hope you enjoyed seeing our trip to Haines! Gorgeous photos, Kristi! Looks like an amazing trip. I grew up 4 hours away from Alaska (in northern Canada) and that part of the continent is just so peaceful and beautiful. I want to move back! Wow Kristi, your trip looks incredible!!! I went to Juneau many years ago, and miss it! 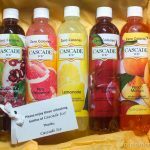 Thanks for sharing your lovely photos! Thank you Kristi. I never dreamed I’d fall so head over heels in love with Alaska, but I certainly did. What an incredible, overwhelming, majestic place. Simply breath-taking. 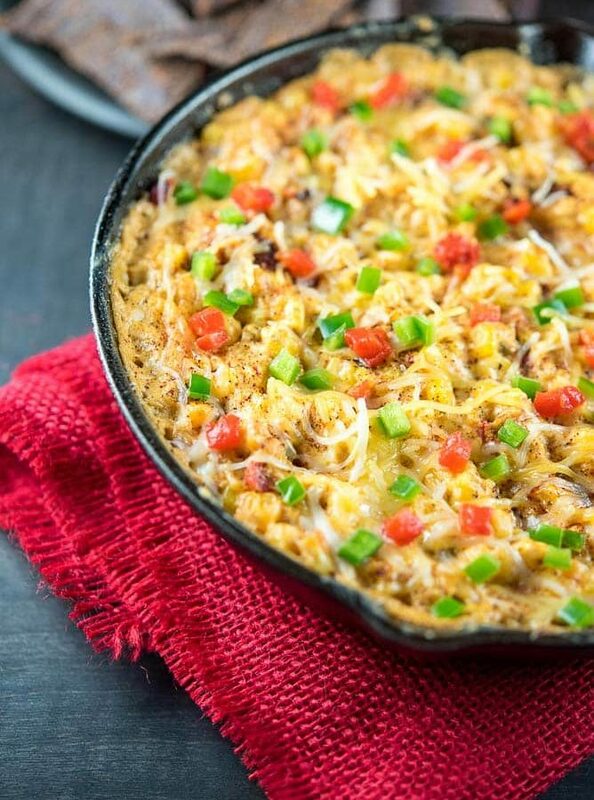 Gorgeous photos and lovely post, Kristi! Thanks Anu. Such a great trip, so to hear that my readers love it too, makes me really happy! 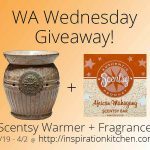 Another beautiful post on Alaska! Your photos are so stunning, Kristi, and I’m so glad you met such great women to enjoy the trip with — sounds like you had a blast! 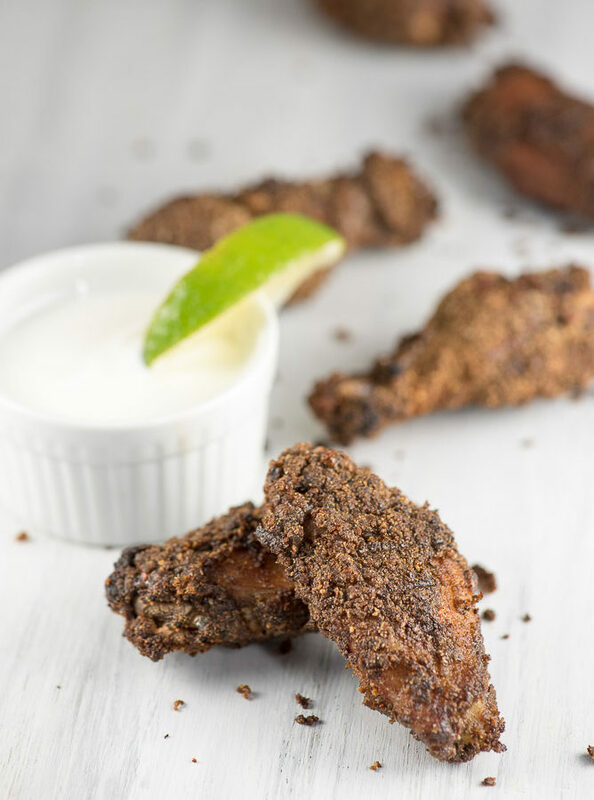 The cocktails and beer sound wonderful, and that halibut with spot prawns…wow does that ever look like my kind of dish! Thanks Marcie. 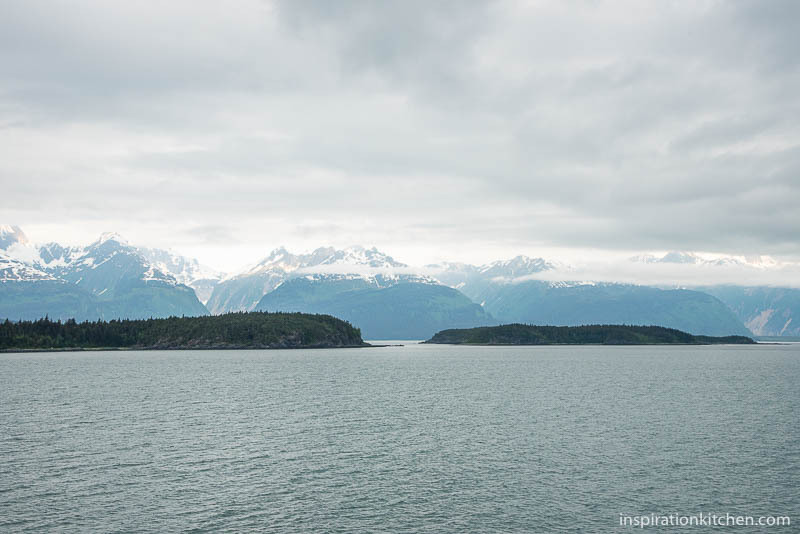 I have one more Alaska post (coming this Saturday) that is my favorite destination of all. The photos there are so beautiful, you are going to love it! 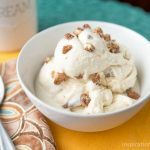 When you come back to Haines don’t forget to also try dessert at the Halsingland. I recommend the Chocolate Truffle Torte with Peppermint Chocolate Chunk ice cream and Raspberry Coulis. Yes, I’d love to Kathy! I’ve heard they have incredible desserts. 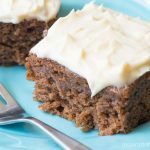 Their dinners were amazing, so I know the dessert has got to be good. 🙂 I can’t wait to visit again and stay in the new hotel in town. Careful Kristi- A visit is how it all starts! 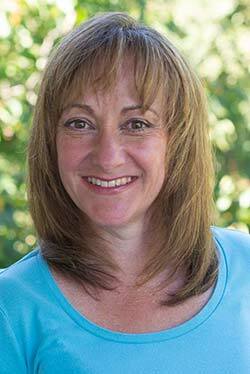 I’ve been in Haines for over a decade now for all the reasons you’ve listed and more! Glad you had such a good time in our community! Thanks Greg! I know exactly what you mean. That visit made me want to come back again, again, and again. What an incredibly beautiful place. I absolutely LOVED it there. 🙂 I can see why you stayed.